Failte! 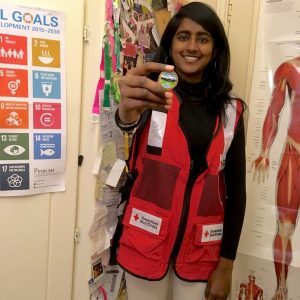 I am Niveta Ramakrishnan, an active Irish Red Cross member as well as a 3rd-year Medical Student at the Royal College of Surgeons Ireland. This summer, I had the incredible learning opportunity to do a surgical observership at Shriners Hospital for Children in Northern California for the second year in Sacramento, California. In just 30 days, I scrubbed in on 53 surgeries and shadowed the attending surgeons for various clinical in general pediatric surgery, pectus, colorectal and circumcision patients. The hospital’s goal is for a world where children do not suffer needlessly from the consequences of the disease, birth defects or accidents. In working towards this goal, I witnessed children from Mexico being flown in, extensively by chartered flights, for various lifesaving surgical interventions – without any financial burden on the family. Quintessentially, weekdays involved long hours spent in operation theatres, conferences, and clinics. Having time to spare on Tuesdays and at the weekend, I sought towards the American Red Cross for learning opportunities. The universality of the Red Cross movement enabled me to continue volunteering during my time in California. It truly was a unique experience to embrace as my wishful request was accepted in the blink of an eye. Objective: To gain a volunteer position at the Sierra-Delta Chapter, Gold Country Region and gain an insight into Service to the U.S. Armed Forces and Disaster Relief. I aim to extend my knowledge and inculcate the essential leadership skills to take initiative in emergencies. The Service to the Armed Forces (SAF) program dates back to the establishment of the American Red Cross by Clara Barton in May 1881. Today’s American Red Cross workers proudly carry on this tradition through the SAF program, which serves as a critical line of communication between the U.S Armed Forces and their families, greeting every wounded, ill and injured service member who arrives via MEDEVAC. The SAF program in the National Capital Region supports military personnel, veterans, and families on 14 separate military installations in the Washington, DC region, at the Veteran’s Administration Hospital, and throughout the community. 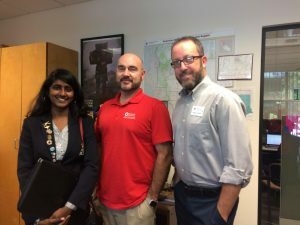 Financial Assistance: The Red Cross partners with the military aid societies to help service members and their families get emergency financial assistance 24/7. Information and Referral Services: The Red Cross provides counselling, guidance, information, referrals and other social services for all military personnel and their families. Deployment Services: Before, during, and after deployments, the Red Cross provides training information, and support for military members and their families. Reconnection Workshops: The American Red Cross has developed the Reconnection Workshops for all military families to assist them in managing the challenges of reintegration. Holiday Mail for Heroes: Hundreds of Red Cross disaster workers are responding to California fires, providing food, shelter, relief supplies and comfort. As evacuation orders are lifted in some areas and people return home, the Red Cross will continue working closely with state and local officials to ensure people get the help they need. I embarked upon this journey towards learning under the sheer guidance of Mr.Tobrin Hewitt. I received ample training as the liaison officer to the service member and their family for the effective communication of emergency messages and assisting in financial need. Each day, I gained new perspectives towards a holistic approach for multidisciplinary teamwork. While addressing those in the region of Sacramento and Yuba City, I felt the pain and suffering in the voice of person calling on the other end. As emotionally taxing as it was initially, I soon learned to put my inhibitions aside for their needs. I will forever cherish those moments that I was able to put a smile on the service member’s face and temporarily ease their pain, with simple words of assurance. This certainly taught me the value of listening. One has to listen to understand, not just to respond or reply. Thereby, being an advocate for change requires powerful tools for effective communication. The Disaster Relief Team lead by Mr.Marcus Raven offered endless opportunities from attending to the California Fires to being deployed for Hurricane in Hawaii. It is intriguing to discover the magnitude of impact instilled by the Red Cross at the time of need, where volunteers unite for the ultimate goal to ease and eliminate the suffering of the vulnerable. I am proud to share the same passion and sheer determination for primordial prevention. I am grateful to have had this opportunity, interacting with global leaders of change, Mr.Stephen Walsh, Regional Director of Communication and Marketing, who shared his journey towards exhilarating advocacy and leadership milestones. Once again, I would like to thank Mr.Tobrin Hewitt and Mr.Stephen Walsh for your valuable time and continued efforts, which has enabled me to play a small role in this noble cause for humanity. I can confidently say that I am part of the American Red Cross family and this experience has truly had a significant impact on me, both professionally and personally.